Annealed glass, heat strengthened glass, tempered glass and insulated glass are the main types of glass used on buildings. Each has unique properties and applications. Strength, breakage pattern and thermal properties are key variables. 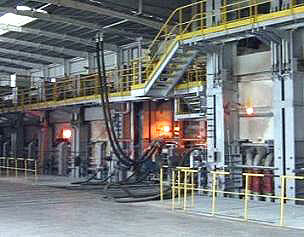 Annealed glass refers to glass which comes from the primary factory, the “float” plant. Most architectural glass is made by melting silica sand, soda ash, dolomite, limestone, and salt cake to 2700 degrees F,and then floating it out atop a pool of molten tin in a continuous process. 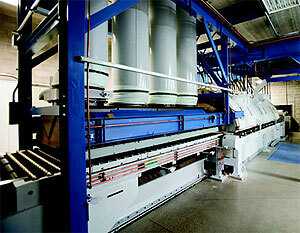 As it is pulled onto a long conveyer, it passes through an annealing lehr, a furnace that controls the cooling process. The flat, cooled, solidified clear stuff at the end of the line is annealed glass. This is cut into large sheets and shipped to other facilities where secondary processes are applied, including cutting-to-size, heat strengthening, tempering and insulating. Annealed glass is heat strengthened so that it can tolerate more rapid and uneven temperature swings during its service life, for instance where the glass is backed with insulation, back-painted, is in the presence of certain Low-E coatings, or uneven shading. To heat strengthen glass, first cut to size, place in tempering until it reaches 1100-1500 degrees F, then cool rapidly. Season to taste. Heat strengthened glass is about twice as strong as annealed glass. Heat strengthening and tempering produce permanent tension & compression within glass, producing correspondingly greater strength. Tempered glass is tempered in order to make the glass significantly more resistant to blunt impact, such as a distracted pedestrian walking into a glass door. Tempering has an additional benefit: if it does break, it does so somewhat explosively in a zillion little pieces, making it less of a cutting hazard. This is why tempered glass is also called “safety glass” and is mandated in doors, sidelites, shower doors, glass handrails and often where people can walk nearby. To make tempered glass, cut to size, heat it in a tempering oven, then cool even faster than heat strengthened glass. This creates a permanent equilibrium of tension and compression within the glass, where the surface layers are stretched tightly across the inner layer, creating strength 4-5 times greater than annealed glass. Glass is insulated in order to give it improved thermal properties. 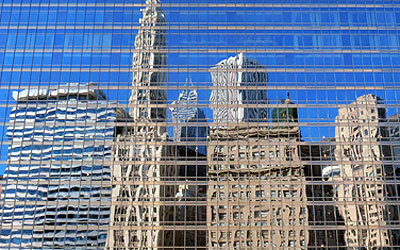 Today most architectural glass is insulated, even in warm climates where it helps with cooling loads. To insulate glass, cut two pieces the same size, clean them, place a dessicant-filled spacer between them, and use one or two layers of sealant to hold the glass together. This seals the airspace between the pieces of glass, creating an insulating layer of dry air. Sometimes this airspace is filled with an inert gas such as argon for better R value. Insulating glass can also be fitted with newer “warm-edge” technology, where the spacer, dessicant and sealant are combined into one material, a thermoplastic which is applied to the glass in a near-liquid state. This improves thermal properties at the glass edge, improving overall window thermal performance. 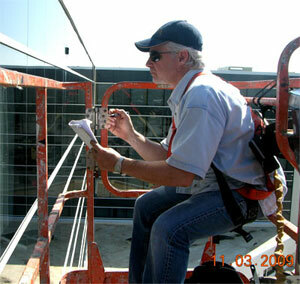 Need glass or information about it? Varying the light in the picture, the light reflection reveals stress waves emanating from the inclusion. The stress is the cause of the glass failure. It developed slowly as the nickel sulfide inclusion grew over time, pressing against the unyielding encasing glass. One researcher estimated that this stress could reach 100,000 pounds per square inch. When the stress exceeded the ability of the glass to contain it, the glass failed catastrophically. Why catastrophically? Because tempered glass, by design, has a permanent internal tug-of- war to the tune of 10,000 pounds per square inch everywhere in the glass plate. Disrupt that structure, and you get...pop!